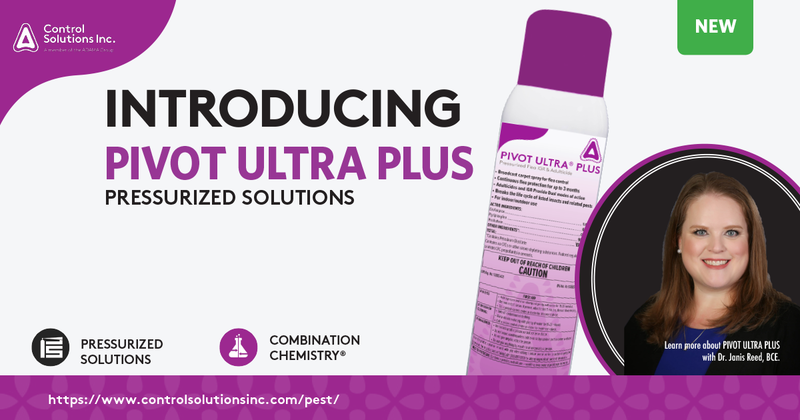 Pivot Ultra Plus is brand new Combination Chemistry® product now available from Control Solutions. This Pressurized Solution from Control Solutions, Inc. offers a long-lasting, highly effective formulation that quickly knocks down and kills fleas and ticks and also provides 90 days of residual control by stopping them from completing their life cycle. "Provides 90 days of residual control"
Pivot Ultra Plus is a fast-dry formulation so your customers can re-enter their property and quickly get back to normal. Containing 3 active ingredients with 2 modes of action, Pivot Ultra Plus will help prevent resistance development in flea populations. It can be applied as a general surface spray to carpeted areas, upholstered furniture, pet bedding, draperies, and more! 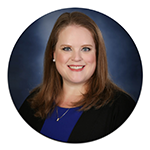 When making applications there is no PPE requirements, so staying compliant with federal and state laws is easy for PMPs. "3 active ingredients, 2 modes of action!" To use Pivot Ultra Plus, we recommend gently shaking the can. Invert the can and apply at a rate of 15 oz (1 can) to 1965 ft2 (or 10 seconds per 80-100 ft2). For best results, hold the can approximately 24” away from the surface to be treated and apply using a sweeping motion. Work towards the exit and back away from the treated area. Use as a crack & crevice, spot, or general surface application to listed areas. "Use as a crack & crevice, spot, or general surface application"
When treating upholstered furniture, be sure to treat under cushions and in seams and folds and to invert furniture if necessary. Remember, fleas are extremely adaptable insects and flea populations can exist inside homes for extended periods of time without a host animal due to the protective pupal stage. Pivot Ultra Plus is remarkably effective against adult fleas. 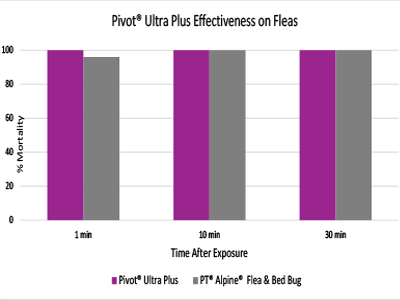 This study, conducted by Texas A&M University shows that Pivot Ultra Plus killed down all the fleas in the study within ONE MINUTE! Additionally, none of the fleas recovered from the treatment after it was applied. This means your customers will notice fewer fleas bouncing around and biting them after a single application. In this study, conducted by Insect Investigations, Limited, black widow spiders were treated with Pivot Ultra Plus. As you can see, within 60 seconds, all the spiders were knocked down. After 24 hours all of the spiders were dead. 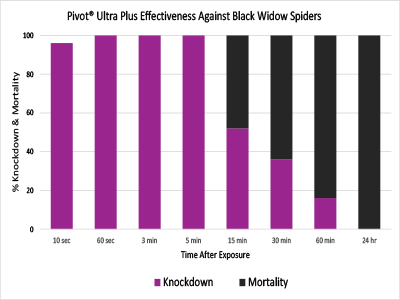 This study also shows that black widow spiders do not recover after being treated with Pivot Ultra Plus. The label for Pivot Ultra Plus allows applications in areas where black widows are active. 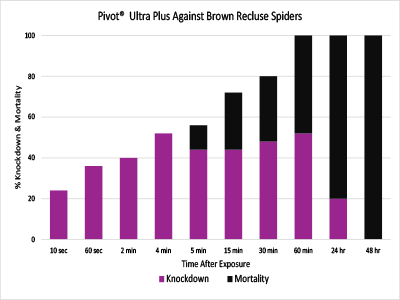 This graph shows the results from Insect Investigations, Limited after Pivot Ultra Plus was applied to brown recluse spiders and observed for two days. After 60 minutes, all of the spiders were either knocked down or dead. By 48 hours all the spiders were dead. Brown Recluse spiders are a tough pest, and having a product you can apply to the spiders when you find them and to carpets, flooring and other areas can be very useful.